Note: The Bitbucket Cloud importer works only with Bitbucket.org, not with Bitbucket Server (aka Stash). If you are trying to import projects from Bitbucket Server, use the Bitbucket Server importer. Import your projects from Bitbucket Cloud to GitLab with minimal effort. Repository public access is retained. 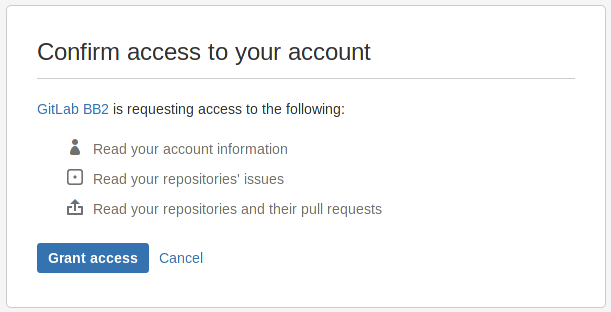 If a repository is private in Bitbucket it will be created as private in GitLab as well. The Bitbucket Cloud integration must be first enabled in order to be able to import your projects from Bitbucket Cloud. Ask your GitLab administrator to enable this if not already. When issues/pull requests are being imported, the Bitbucket importer tries to find the Bitbucket author/assignee in GitLab’s database using the Bitbucket ID. For this to work, the Bitbucket author/assignee should have signed in beforehand in GitLab and associated their Bitbucket account. If the user is not found in GitLab’s database, the project creator (most of the times the current user that started the import process) is set as the author, but a reference on the issue about the original Bitbucket author is kept. Sign in to GitLab and go to your dashboard. Click on the “Bitbucket Cloud” button. Click on the projects that you’d like to import or Import all projects. You can also select the namespace under which each project will be imported.